It looks great in my husband man cave. Very soft under his feet. It's looks just as described. 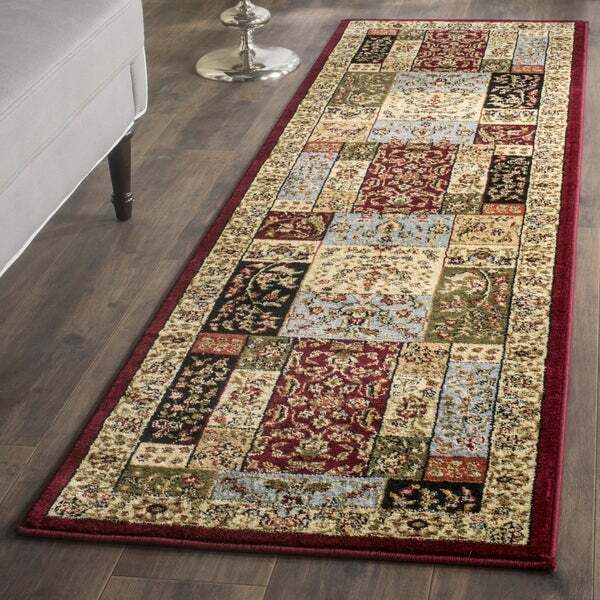 This floor rug has a multi color background and displays stunning panel colors of burgundy, green, gold and blue. The two runners are perfect for the floor in front of my two sinks in the kitchen. I recommend a non skid pad as they slide a bit on the maple floors. Beautiful colors and design.. love these rugs! Love this rug. Vibrant colors. Good quality. Wish I had ordered the carpet pad that goes underneath to keep from slipping. Very happy with my Safavieh runner. Matches my round rugs! Love the color and the feel! I love the design and colors in this rug. I ordered 3 of them and they look great in my living room. The rugs are durable and vacuum up good. I'm pleased with them and glad I made the purchase. Very happy as colors are great for a hall carpet with much travel, really lays flat and feel there is not danger of slipping as it stays right to the floor. Ordered 2 room size carpets at the same time with dining room carpet same as hall carpet. This pairs with the living room as colors are same but switch around of predominant color. Look so good together and I am very happy with all three. Really stay put on the hardwood floor without using a pad. Happy with all. These were truly beautiful once arrived, however, they aren't natural materials. We already experience anaphylaxis in our home. Overstock was great to take it back. Once I realized that Olefin is an oil based plastic and how it could effect us with existing allergies, I did try to cancel within minutes online and by phone, and several times for days after the order...Overstock even tried to pull it back from shipping, but I received 2 of the 3. The rugs were really off gassing through shipper damaged packaging...it would not have worked for us. I didn't reorder anything as I am truly shocked by the prices of carpets and off gassing. For example, we have two long wool runners that I wanted to replace in the family room that I purchased 10 years ago for *** each...kind of heart broken. I hand washed the old wool, dried them in the sun for days and a run in the dryer (crazy). Then glued the fringe back in place and instructed my boys to take it easy...so far no mold and hanging in. Thank you Overstock for the support. This runner is exactly what I wanted. I'm, however, having trouble keeping it from sliding a little, even with the Nourison non-slip rug pad under it. Any suggestions?? I love all the colors in this rug and has a country feeling to it. The length is really good as I was looking for a longer one in front of my sinks. Great rug ... looks good ,, price was unbelievable! would recommend to a friend, looks great in our kitchen and lays perfect on floor. have received a lot of compliments on the style and look, especially color. did comparison shopping with other vendors and overstock has the best pricing. great buy and would consider buying again. Certainly like the way these look thru my foyer. Would definitely buy again, and would def recommend to others. Have this rug in front of the kitchen sink to protect wood floor. It looks very nice and has held up well (purchased it 18 months ago). For the price, I can replace it when needed. I'm thrilled with this hall rug. It is made of beautiful rich colors and is a perfect match for my décor. Gorgeous runner. Very soft I have the big rug to match it. perfect length to compliment king bed as side runners. Colors match our room and provide versatility if we change the colors later. Please refer to this rug cleaning guide. Safavieh Lyndhurst Traditional Multicolor/ Ivory Rug - 3'-3" X 5'-3"